Andrew Z. Teoh was appointed to the University of Houston System Board of Regents by Governor Greg Abbott in 2018 and will serve through May 31, 2019. For fiscal year 2018-2019, Regent Teoh will serve as a member of the Academic and Student Success and the Finance and Administration Committees. Teoh is a senior in the Honors College and the C.T. Bauer College of Business completing a Bachelor of Business Administration in Accounting and Finance with a minor in Marketing. 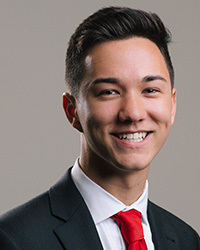 Andrew has served in several capacities at the University of Houston, including as Vice Chair of the Student Fees Advisory Committee, a role in which he advised the Chancellor on how to allocate $22.3 million in Student Service Fees. Previously, he served as Vice President of Programming for the Residence Halls Association and Treasurer of the Honors Student Governing Board. During the spring of 2018, he interned in Washington, D.C. for the office of Congresswoman Tulsi Gabbard. The following summer, he worked for the White House Initiative on Asian Americans and Pacific Islanders. Teoh graduated from H.P. Baldwin High School in Wailuku, Hawaii. He is a Bauer Excellence Scholar and a National Merit Scholar.